The book looks at losing weight in a different way. We all know that the only way to lose weight is to eat less, but this does not always come to us easily, especially when we are bombarded by a load of rules and requirements as well as lists of excluded foods. This cookbook does not involve calorie counting, refer to a pre-calculated index, exclude some essential food or worse still, limit the selection of foods allowed. 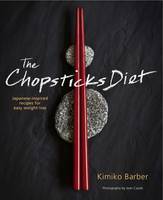 There is one basic rule – eat these delicious healthy balanced Japanese foods with chopsticks. Chopstick eating naturally promotes smaller mouthfuls and slows you down.